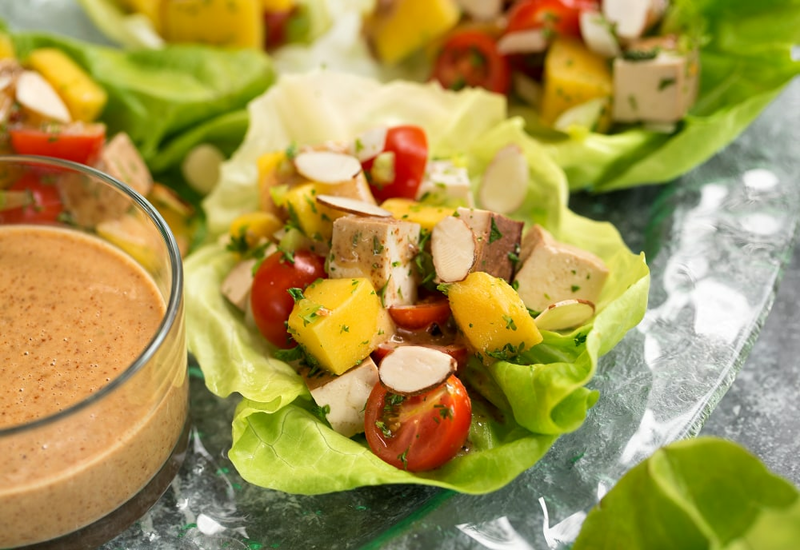 Equal parts spicy and refreshing, each bite of these salad cups brings the heat with a spicy, creamy almond sauce, while playing cool with a sweet mango-tofu salad, all swaddled in crisp lettuce leaves. Can’t find the right chile pepper? Substitute ¾ to 1 teaspoon crushed red pepper flakes. The sauce can be refrigerated in an airtight container for up to two weeks. The salad can be prepared up to a day in advance, covered and stored in the fridge. Per Serving: 202 calories; 10g fat; 24.6g carbohydrates; 7g protein; 0mg cholesterol; 302mg sodium. The mango was my favorite aspect of this dish! Overall this reminded me of a delicious, Carribbean-inspired vegan salad. The almond sauce was a little zesty and a little sweet, which complemented the salad nicely. I can't wait to make these again, they will be perfect for my next get together. I made these salad cups the other day and they were very good. Instead of tofu I used grilled chicken, and it was delicious. The almond sauce is impeccable, definitely a favorite. I took this idea to make Thai mango tofu bowls instead of salad cups. I made it with savory coconut rice. For topping I did mango, almonds, and cilantro, and also added avocado, green onions, and red pepper flakes. It was super delicious! I didn't make this exact sauce, but I loved the tofu wrapped in the lettuce leaves! I used an extra half of a jalapeño for additional spice. It was perfect, so glad that I made this. Definitely don't skip the sliced almonds, they add a great texture and crunch to the salad. Every once in awhile I like to enjoy a meatless meal. This recipe was exactly what I was craving. I was getting tropical vibes while I was eating it, thanks to the mangoes. The Thai almond sauce was also delicious, sans the syrup, I used honey.